Another ZendCon has come and gone. I've been cutting back on the number of conferences I attend, but I've been to every ZendCon so far, and I hope to continue the trend for years to come. 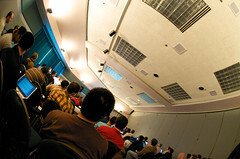 Along with php|tek, it's one of the best perennial PHP conferences. 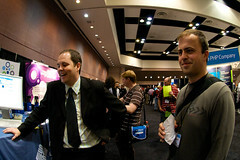 Although ZendCon has a reputation for being business-focused, there's a strong community presence. I've been a community advocate since before PHPC began, and I still derive the most value from the hallway track. I was happy to meet a number of people from the community that I hadn't met before including Rob Allen, Ralph Schindler, Juliette Folmer, and the charismatic Lorna Mitchell. Andrei and Terry were the unofficial social chairs of ZendCon, but because Terry had to take a holiday just to attend one day (Wednesday), I helped out. Organizing social events can be difficult, because you want to balance being inclusive with the benefit of small groups, so we tried to invite different people each night as well as make our plans known, so that anyone left out could self-organize. This worked out best at The Rose & Crown Pub, where it felt like all of ZendCon was in attendance. Even Ed stayed out past his bedtime, and several people left with their own Hofbräuhaus beer mug. I learned that the conference was right across the street from WhiteHat, and I finally met Jeremiah Grossman. Rob captured the moment for posterity. (Thanks, Rob.) Jeremiah suggested I attend OWASP AppSec this week, since it's taking place in New York, so you might see me there. If nothing else, I hope to participate in a social event or two. 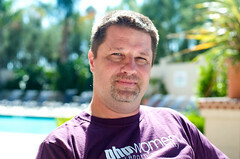 While at ZendCon, I reflected on how much Cal Evans does. Officially, he's the editor of the Zend Developer Zone and has become affectionately known as Carl Blevins for his spelling mishaps, but over the past few years, he has become the personification of Zend that the PHP community considers one of our own. Everyone admires Andi and Zeev, but Cal is more immersed in the community. With his honest, straightforward responses to criticism, he reminds me of Nat Torkington. (Nat's response to "O'Reilly gripes" persists as one of my favorite examples of character, and comparison to his work at O'Reilly is the greatest compliment I can think of.) 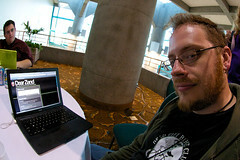 So, it occurred to me that not only would ZendCon not be the same without Cal, neither would Zend. I gave one talk, Security-Centered Design, which is easily the quirkiest talk I've given. I spent most of the time explaining what little I know of cognitive psychology, touching on topics such as change blindness and ambient signifiers. I was pleasantly surprised to see such a full room, because Terry's talk was scheduled for the same time. I suspect most people who came to my talk simply didn't realize that. :-) My slides are available, but because most of the content consists of videos, live experiments, and commentary, the slides don't offer much value. I'm open to suggestions about how to best offer the content of this talk to those who couldn't attend. I'll be giving it again at php|works in Atlanta, so maybe you can see me there. I'm now left with fond memories of wild garlic, the DiskCon museum, digital SLRs, social planning, and friends not soon forgotten. Goodbye, everyone, and I hope to see you next time.